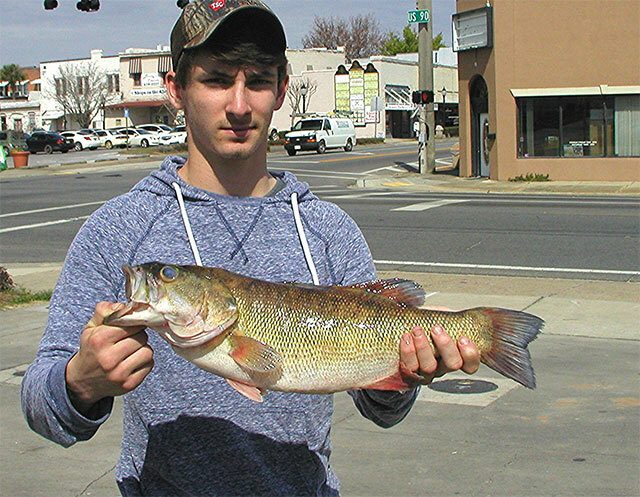 Tucker Martin, 17, from Chipley, set a new state record for shoal bass on Sunday, March 8 around 5 p.m. He was bank fishing with a friend on the Chipola River, in northwest Florida’s Jackson County, when he cast a spinner bait up under a bridge and the fight was on. He was expecting to catch a spotted bass or largemouth, but landed a shoal bass that weighed 4.49 pounds (4 pounds, 8 ounces) and measured 20.3 inches in total length, with a girth of 14.4 inches. Martin and his grandfather, Edgar Bush, met Florida Fish and Wildlife Conservation Commission (FWC) regional biologist Chris Paxton at the Main Street Market in Chipley. After congratulating the young angler on his success and verifying the species, the fish was weighed on certified scales. Martin’s bass surpassed the previous record by nearly 6 ounces. Shoal bass are one of five black bass species found in Florida. Black bass are all part of the sunfish family, which includes bluegill and crappie. The Florida largemouth bass is by far the most common and largest of the black basses in the state. In addition to the shoal, Florida has Choctaw, spotted and Suwannee basses. All four are found in northwest Florida, whereas the largemouth is found throughout the state. It is easy to distinguish largemouth bass from the other black basses because the first and second dorsal (back) fins on shoal, Choctaw, Suwannee, and spotted basses are connected. The dorsal fins appear separated in largemouth bass by a notch between the spiny and soft dorsal fins. In addition, the upper jaws of shoal, Choctaw, Suwannee and spotted bass do not extend back past the eye as it does in largemouth bass. People can distinguish shoal bass from Choctaw, spotted and Suwannee bass because, unlike those other species, shoal and largemouth basses do not have a patch of teeth on their tongue. Because these northwestern Florida black basses don’t grow as big as the largemouth and have limited ranges, the FWC is considering new rules to help sustain their populations. Anglers can learn more about the proposal and comment by visiting bit.ly/BassRules, accessible by going to MyFWC.com/Fishing and selecting “Freshwater,” “Black Bass Management” and “Bass Regulations.” The rule would not go into effect until July 2016, depending on public input and the vote of the FWC Commissioners.In addition to state records, the FWC also recognizes anglers by giving them a Big Catch certificate for landing shoal or spotted basses that are heavier than 2 pounds or longer than 16 inches and Suwannee bass heavier than 1.5 pounds or longer than 14 inches. Visit BigCatchFlorida.com to register and submit any of 33 different species of Florida freshwater fishes for recognition. In addition, anglers can claim a Black Bass Slam by catching a largemouth bass, a spotted bass, a shoal bass and a Suwannee bass all within a one-year period.